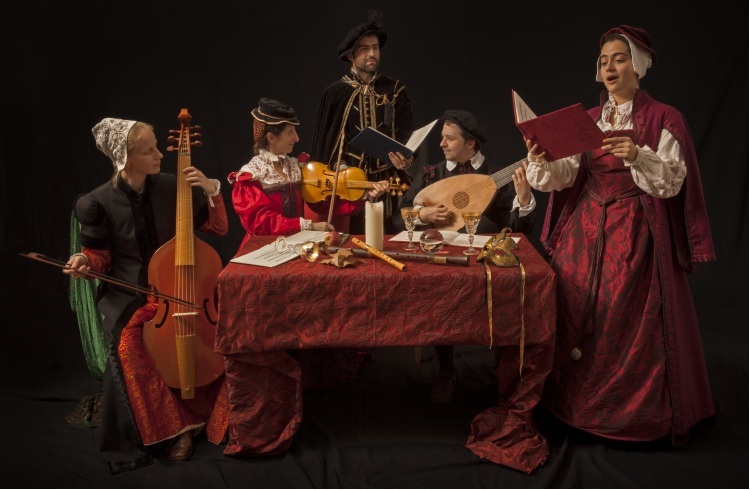 Passamezzo was founded by Tamsin Lewis in 2001, initially to explore the Jacobean Masque. The core membership of the ensemble has expanded to: Eleanor Cramer (soprano), Alison Kinder (viols and recorders), Tamsin Lewis (Renaissance violin, viols, voice), Richard Mackenzie and Robin Jeffrey (plucked strings), Richard De Winter and Michael Palmer (actors and baritones), and Charlotte Ewart (choreographer) . Passamezzo often work with dancers and actors. They have played in a great variety of venues including the British Museum; the Victoria and Albert Museum; Shakespeare's Globe Theatre; Hampton Court Palace and in theatres, concert halls, stately homes, churches, palaces and ruins throughout England. Television and Radio credits include: Danny Dyer's Right Royal Family (BBC1); BBC Restoration; Howard Goodall's The Truth about Carols (BBC2); Elizabeth I's Secret Agents (BBC2); Big Brother (Channel 4); Henry VIII and his six wives, and Elizabeth I (Channel 5); Frost Fair; King Lear and Boxing Day, (Radio 4); Vic Reeves’ Rogues Gallery (Discovery); Early Music for the Holidays; Christmas Carols, Chant and Legend (Harmonia Early Music/PRX). A passamezzo was a popular sixteenth century tune and dance. It could be played and danced simply and enjoyed by anyone, but could also become an exhibition piece, with virtuosic and showy divisions played upon it. We chose the name Passamezzo for ourselves because we feel it reflects the character of our work: we provide a wide range of performances from the very simple to the very elaborate, and pride ourselves on creating a piece which suits your occasion perfectly.